What caused Füssen's instrument making to decline in the 18th century and what happened to its masters? As we saw in Part 1, by 1600 there were 18 lute makers registered in the small Bavarian city of Füssen. In 1628 the plague, which in those days infested huge parts of Europe, reached Füssen. Similar to the situation in Cremona (1630) and in Brescia (1632) the population was seriously reduced. In the case of Füssen the effect was even more dramatic because instrument making depended on trade, which as a consequence of the plague nearly came to a halt. In 1618 the Thirty Years War had broken out and during the course of this European-wide conflict the Swedes occupied Füssen in 1632. To give an impression of the impact of these combined circumstances we have only to take a look at the population of the city. Having amounted to around 2,300 in 1600, it was reduced to a meagre 800 after the war. The number of lute makers shrank accordingly: of the 18 masters registered before the war (not including journeymen and apprentices), just five, who only worked part-time, survived after the end of the war in 1648. Further developments came with the turn from the 17th to the 18th century, when a substantial change in musical taste took place. Up to this point the main focus of makers in and from Füssen lay in the production of plucked stringed instruments. The work in particular of those masters who moved to cities in northern Italy and Rome shows excellent craftsmanship and an effort to combine tone quality with an outstanding decoration. 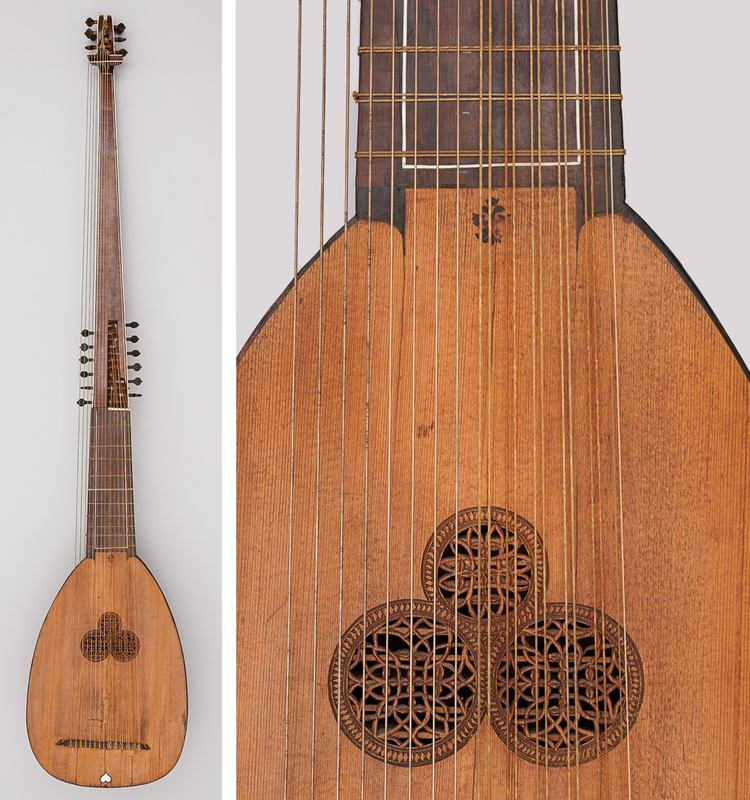 We find lutes, theorbos and guitars bearing fingerboards with ornate engravings in ivory or mother-of-pearl, peg-plates decorated with costly materials and guitars with complex, filigree rosettes. In addition to these outstanding pieces of art there must have been a separate line of production to meet the high demand for good-sounding instruments at an affordable price. However, from the late 17th century the lute fell out of fashion, in part due to the rise of keyboard instruments and the demand for instruments with a more powerful tone. Accordingly the production in Füssen and elsewhere shifted from plucked to bowed instruments and during the German Baroque era Füssen became an important center of production for bowed stringed instruments. By the 18th century the majority of Füssen makers came to rely on the Cremonese method, using an inner mould. 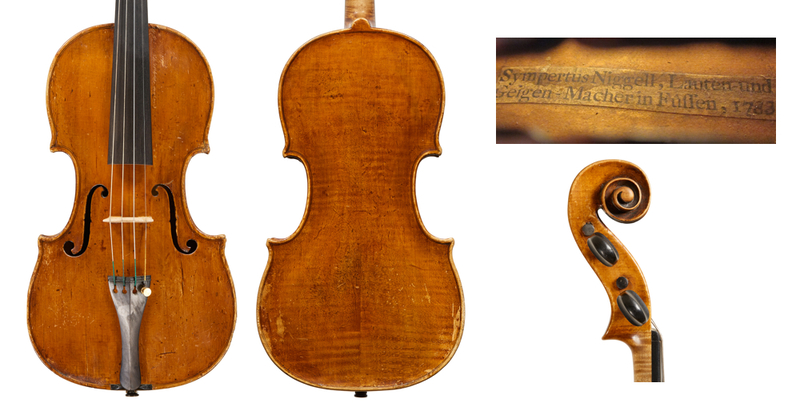 There is evidence that some Füssen violin makers in the late 17th century constructed instruments by setting the ribs on the nearly finished back-plate and reinforcing the glue-joints with small cleats. This old-fashioned and typically German method was later abandoned and by the 18th century the majority of Füssen makers came to rely on the Cremonese method, using an inner mould. However, from a stylistic perspective there are no similarities with the Italian instruments. The shape of the arching and of the f-holes show a kinship with Stainer’s instruments and the shades of the varnish are generally on the dark side. The output of the Füssen workshops comprised not only the usual bowed stringed instruments but also a considerable number of violas d’amore and even a few barytons (a bowed string instrument similar to a viol but with an additional set of sympathetic strings that can also be plucked). 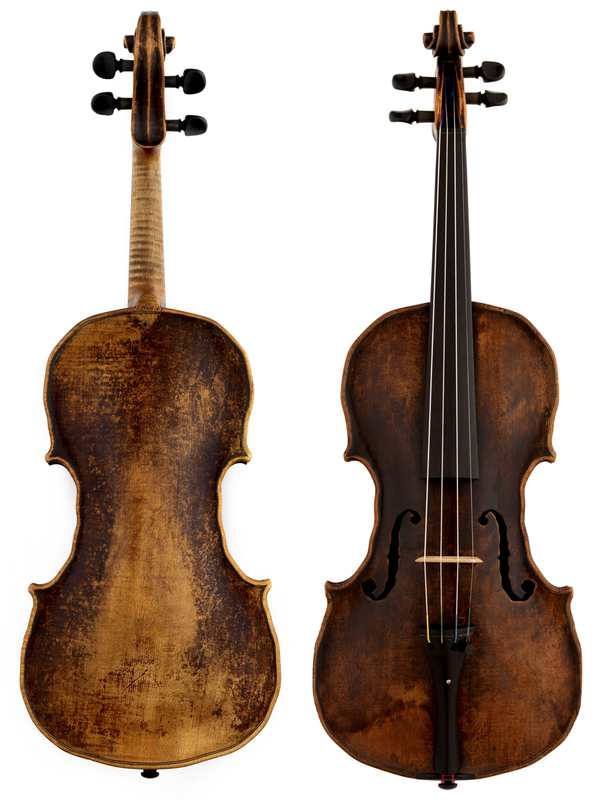 Other centers of violin making either benefited or emerged as a result of Füssen’s decline and the consequent migration of talented craftsmen, including Mittenwald, Vils, Prague and Vienna. A few examples may illustrate this development. Matthias Klotz, who was to become the founder of the Mittenwald school, seems to have studied the craft in Füssen and subsequently is found in Padua, where he worked with Pietro Railich. The latter came from the Allgäu and had a shop first in Venice and then in Padua. In Vils, a city close to Füssen but belonging to Tyrol (Austria), we find members of the Rief and Petz families. The upswing of the Bohemian school, especially that of Prague, would not have been possible without masters from Füssen: Balthasar Khögl, Andreas Ott and Leonhard Pradter came from the Allgäu. This also applies to Johann Kleinhans, who became a citizen of Brno (Moravia) in 1695. Vienna in particular benefited enormously from the migration of makers: Thomas Epp (d. 1644), Hans Khögl (1614–1680), Martin Mathias Fichtl (1649–1707), Johann Georg Thir (1708–1779) and his student and follower Franz Geissenhof (1753–1821), Bernhard Enzensperger (1788–1865), Martin Stoß (1778–1838) and Bernhard Stoß (1784–1854) all moved from the Allgäu to the Austrian capital. Among the masters who remained in Füssen were Johann Anton Gedler (1725–1790), who became known for his instruments with an undulated outline, and members of the Niggel family. Bletschacher’s reference book mentions 12 Niggl family members, the most important being Simpert Niggel (1710–1785). In some cases entries in the respective baptismal records are not available, which makes it impossible to establish the precise relationship between the family members. Unlike the masters in Mittenwald, Markneukirchen or Schönbach, the Füssen violin makers never relied on the division of labor. Füssen’s decline as a center of instrument making over the course of the 18th century was largely thanks to a dramatic change in the the economic structure of instrument making. By the end of the century not only the important cultural centers but also small cities housed instrument makers who could meet the local demand. The export of and trade in instruments suffered from this diversification. Unlike the masters in Mittenwald, Markneukirchen or Schönbach, the Füssen violin makers never relied on the division of labor. This made their instruments more expensive and less competitive. A final blow for the craft came with the trade restrictions caused by the Napoleonic wars from the late 18th century. By the end of the 18th century the city had lost its predominant position and with Josef Alois Stoß (1787–1866), the last Füssen-based violin maker died one generation later. The huge number of violin makers who left the city in the 18th century disseminated stylistic features of the south German tradition in other countries, especially in Austria. When looking at an early instrument by Anton Posch or J.G. Thir, for example, we still can see a hint of the slender body shape or the upright position of the f-holes, typical of the Füssen school. Rudolf Hopfner is director of the Collection of Historic Musical Instruments at the Kunsthistorisches Museum, Vienna. Next week he explores the early Viennese school of violin making.